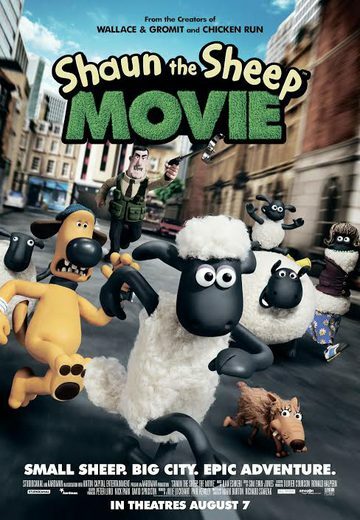 SHAUN is a clever, mischievous sheep who lives with his flock on Mossy Bottom Farm, under the nominal supervision of The Farmer, and Bitzer, a well-meaning but ineffectual sheepdog. Despite Shaun’s best efforts, life on the farm has got into a bit of a rut, and Shaun concocts a cunning plan -- to have a day off. But be careful what you wish for. Events rapidly escalate out of control and Shaun’s mischief inadvertently leads to the hapless farmer being taken away from the farm. With the flock’s help, Shaun must leave the farm for the first time and travel into the Big City in order to rescue The Farmer -- and failure is not an option. But how will the sheep survive? Can they avoid being recognized as sheep? And thus avoid the clutches of a fearsome animal catcher? In the course of an action-packed adventure they experience a host of wild, funny mishaps. And Shaun meets a little orphan dog called Slip who makes him realize that having a home and a family is not something to be taken for granted.